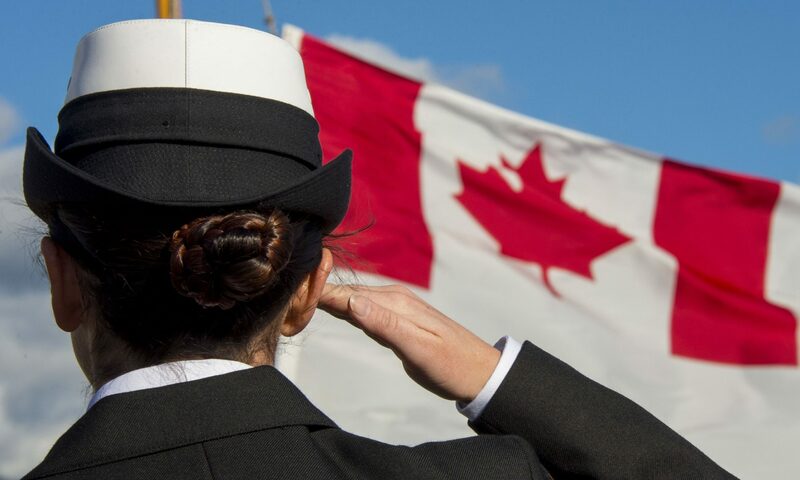 Welcome to the temporary Servicewomen’s Salute – Hommage aux Femmes Militaires Canada website! A new Portal website is in development and will be appearing shortly with a new look and more functions. 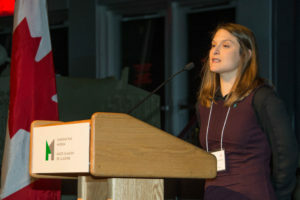 The Portal website will begin by including two public Search Directories listing helpful research understandings of current and veteran Canadian servicewomen’s lived experience, and local community-level services including peer supports available across Canada; calendar of events occurring across Canada involving veteran and current servicewomen; and, story-telling and sharing of stories and artifacts. 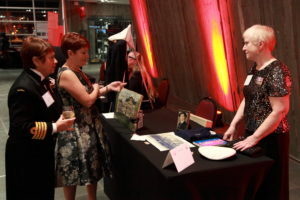 In the interim, we are describing here current Servicewomen’s Salute Canada activities, our multiple collaboration projects, and wonderful photos and mementos of the December 13, 2017 Canada 150 Servicewomen’s Salute Reception and Dinner held at the Canadian War Museum in Ottawa, Canada’s national capital. For more information and to view more photos, please visit our Facebook Page, and Public Group Discussion, and Instagram site. 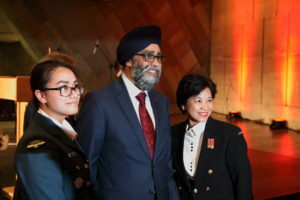 Our objective is to Know, Honour, and Strengthen the contribution of military women to Canada. 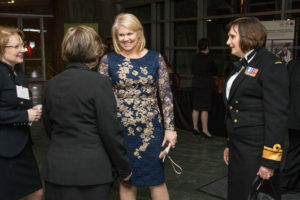 472 former or current servicewomen, dignitaries, and supporters attended the sold-out December 13, 2017 Canada 150 Servicewomen’s Salute – Hommages Aux Femmes Militaires Reception and Dinner held at the Canadian War Museum in Ottawa. 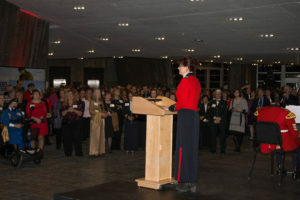 Its goal was to publicly recognize and celebrate military women’s 132-year, historic, and continuing service to Canada. 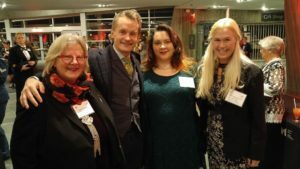 It was a moment in time for servicewomen and their supporters to enjoy being the primary authors, protagonists, and tellers of a larger extraordinary story “Our Past Our Story Our Future”. All December 13 2017 photos taken by Cpl Levarre Macdonald Canadian Force Joint Imagery Centre are coming soon. 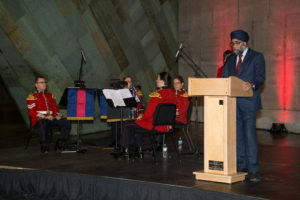 Beginning at 1730hrs, December 13 2017 Servicewomen’s Salute guests gathered in the Canadian War Museum’s Lobby to meet with friends, military family members, colleagues, invited special guests and dignitaries, enjoy music played by Governor General’s Foot Guards Band musicians, and visit and talk with representatives at 12 Servicewomen’s Salute Thematic Displays. Volunteer retired and current servicemen assisted guests on arrival and departure. 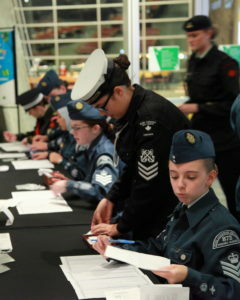 12 Army, Air, and Navy Cadets and CIL officers assisted attendees’ registration. At 1850hrs, guests and the Dinner’s Head Table were piped in to the museum’s LeBreton Gallery. The Dinner programme began with a Territorial Acknowledgement of the land, unceded traditional Algonquin Anishinaabeg territory, on which we gathered. Canadian War Museum WWI historian Dr. Mélanie Morin-Pelletier welcomed guests on behalf of the museum. RSVP regrets sent by retired Supreme Court Justice Marie Deschamps, and the Honourable Sheila Copps were read out by Master of Ceremonies Major(ret’d) Perron. The GGFG flute quartet played O Canada to the standing audience, and Chaplain Colonel Barbara Putnam led the saying of Grace. 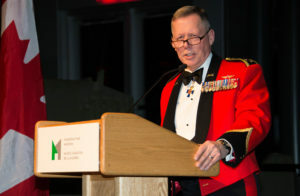 Canadian Armed Forces Chief of Defence Staff General Jonathan Vance, and Honorary Naval Captain Sharon Johnston then gave invited speeches offering contemporary and historic reasons supporting the Canada 150 event’s celebration. As guests enjoyed their 3-course dinner and wine, a Photo Montage, and WWII recruiting video were shown on the Gallery’s stage screen . 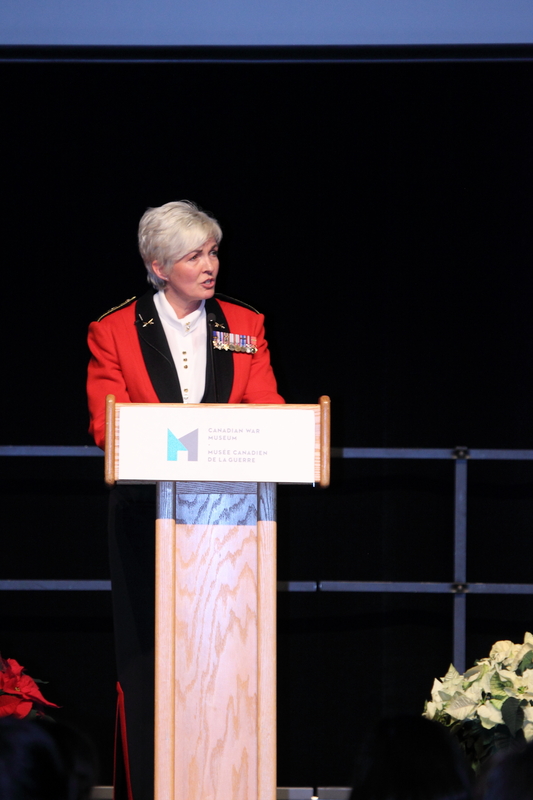 Chief of Staff Army Operations Brigadier-General Jenny Carignan gave the final invited speech of the evening to reflect on how far we have come as a country, and what can lie ahead for future CAF servicewomen and men. The evening programme ended with closing remarks by Organizing Committee Lead LCdr (ret’d) Rosemary Park. Servicewomen’s Salute Organizing Committee members and Committee supporters (shown in the evening Programme) stood to receive the applause of guests. 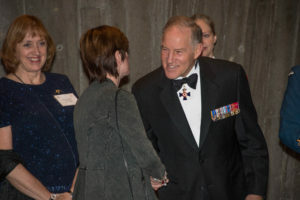 Master of Ceremonies Major(ret’d) Perron presented a thank-you tribute to LCdr (ret’d) Park commemorating the symbolism of the Canada 150 Servicewomen’s Salute event, and a personal poem and memento gifts for all attendees. Broadcast difficulties prevented showing NATO College in Rome LGen Whitecross and staff’s video greeting, plus screening of the new November 2017 CAF recruiting video for women recruits. 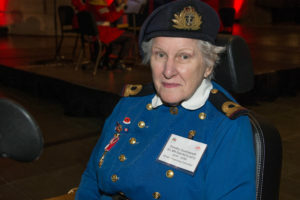 A recording of LCol (ret’d) Susan Beharriell’s 1885-2017 storyline that includes reflections written by both Canadian Armed Forces servicewomen attending the October 8, 1992 Servicewomen’s Salute Dinner on Parliament Hill, and by servicewomen attending the December 13 2017 Dinner will be posted on the website. 37 of the 47 10-person Dinner Tables in the LeBreton Gallery had reserved Table name cards. 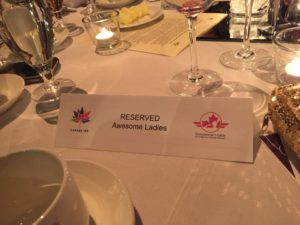 “Amazing Ladies”, “CFHS Social Workers”, “CSRT Chicks”, “Classede92”, “In Honour of Col Karen Ritchie”, “Its Just 700”, “Killers from the Sky” RCAF Women”, “Team Epic”, WomenStrong” and “WomenStrong2” were among those chosen. This site and our Instagram (@servicewomensalute) provide a growing catalogue of Reserve and Regular Force servicewomen’s lived experience, historical, research, art, literature, and film resources and representation describing Canadian servicewomen’s military participation from 1885 to the present day. The objective of a one-stop, interactive, and curated resource and network of expertise did not exist …Until now. 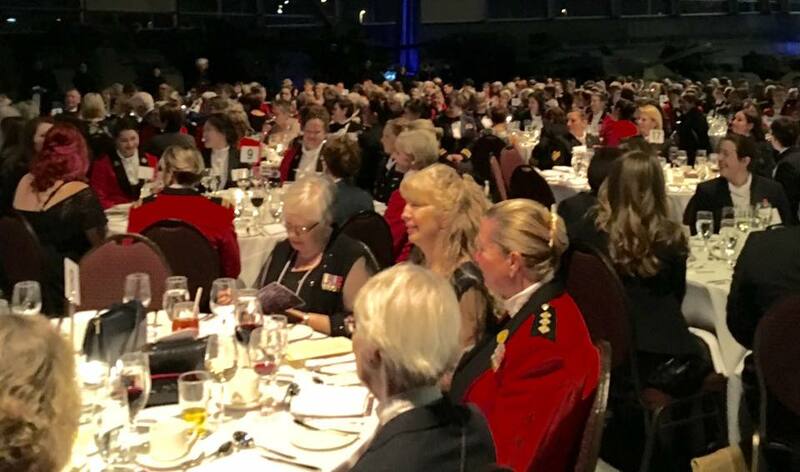 Stories of Canada 150 Servicewomen Salute Reception & Dinner attendees are being collected to help tell our larger history in a presentation. Click here to submit your own story . Note: A password is required to access the submission form. This password is sent to event ticket holders. 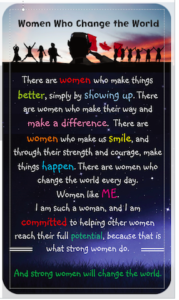 If you forget or misplace the password please contact info@servicewomensalute.ca and we will send it to you. 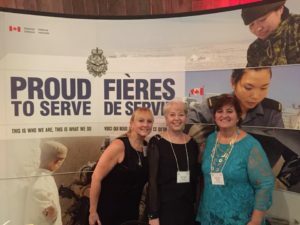 Servicewomen’s Salute – Hommage aux Femmes Militaires began in 2017 as a citizen-led volunteer Canada 150 Campaign To Know, Honour, and Strengthen the historic and continuing contribution of former and current Canadian Armed Forces servicewomen to Canada. 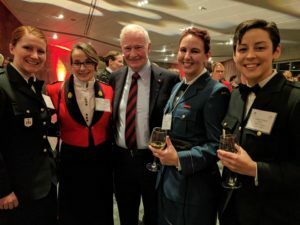 The 2017 Servicewomen’s Salute fact-finding exercise behind this Legacy Campaign found significant offers of help and interest by former and current servicewomen and men, Members of Parliament and Senators, Canadian War Museum, local museums and archives, public libraries, Military Gals Facebook site Administrators, Historica Canada, Nursing Sisters Association of Canada, WRCNS Toronto branch, HMCS York and Carleton, many university researchers, Women in Defence and Security, and ‘hidden gems’ of Canadian history, archived local records and artwork located all over Canada. 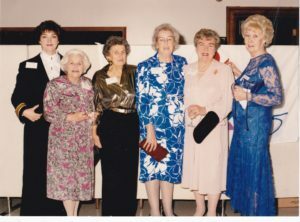 We found many many former and current women with hugely fascinating stories, and shared much laughter. no ongoing opportunity for servicewomen to share, digitally record, enjoy and benefit from their reflections and insights arising from their experiences as military members. 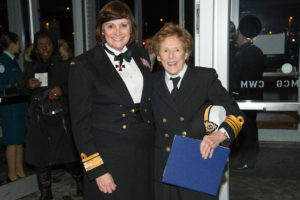 Also evident was rare external leadership and supporting voices in the public narrative about Canadian military women, and their service to Canada. 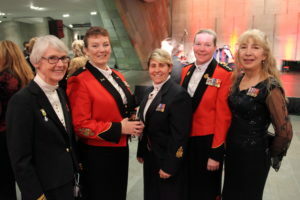 The Canada 150 Servicewomen’s Salute Organizing Committee ended the Canada 150 sesquicentennial year by staging the Canada 150 Servicewomen’s Salute at the Canadian War Museum honouring and recognizing Canadian Armed Forces servicewomen. December 13, 2017 was expressly chosen because it was the centennial week of Canadian women granted full suffrage ie municipal, provincial, and national voting rights in Canada as a result of the September 20 1917 Military Voters Act. An estimated 504 Royal Canadian Army Medical Corps Nursing Sisters serving overseas in France were therefore the first Canadian women to vote early on December 5, 1917. 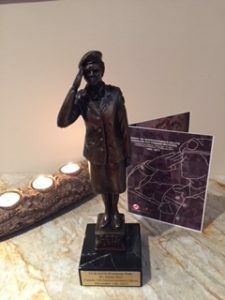 Because of the September 20 1917 Military Elections Act, an additional 50O,000-plus Canadian adult women of military family members serving overseas were also allowed to vote on December 17 2017.
a. creation of an online, interactive SWS Search Directory of historical and contemporary resources describing Canadian military women’s history, lived experience, research, artistic expression, and artifact catalogue listings. b. Ryerson University Media Production student team’s production of ‘Mini-docs’ and recorded interviews, plus other oral history collection, and personal narrative digital story workshops for exhibition at a December 2018 event. 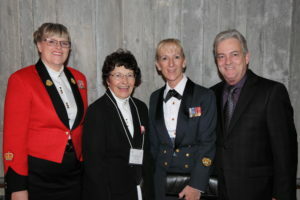 c. Incorporation of a Servicewomen’s Salute Member Association to recognize and support former and current Reserve and Regular Forces servicewomen’s loyalty and contribution to Canada.